A man who woke at home with a high-security bike lock around his neck after a night out needed a rescue team to get it off. 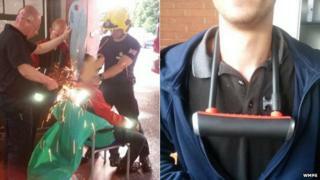 The unnamed man, in his 20s, was taken to Coventry Fire Station by his mother because he could not remove the hardened-steel shackle lock. The station commander said the man was unhurt, "but his mother was raging". Pete Drummond said: "We tried a cutter, but it just marked the lock. Then we tried a reinforced bar cutter, but it just dented it". He said the man had been out drinking until the early hours and did not know when the lock was put round his neck. "He woke up at about 16:00 BST and found his mates had put the lock round his neck and his mates had thrown away the keys," said Mr Drummond. "His mum brought him in at about 19:30 BST. He really did have his tail between his legs". The rescue unit covered the man with a fireproof blanket and cut through the steel with a circular saw. Why do we risk embarrassing encounters with firefighters?